Disposing of documents safely is something that most businesses have become used to prioritising. There may be many different motivations for this but at the heart of them all there tends to be one overarching factor: respect. Over the past couple of years the importance of data has been underlined by new regulation and by the experiences of those who have suffered the very public consequences of a lack of data security. That’s why respect for data is now one of the main motivating factors in why companies partner with a shredding service. However, it’s not the only one. For many businesses it’s simply a question of showing respect to customers. There can be some serious consequences to not protecting data. Identity theft is becoming more common and the cost can be substantial. For many organisations, a shredding service is the most obvious way to demonstrate to customers that the business has enough respect for their data to take steps to positively protect it. Nurturing customer loyalty in competitive markets is increasingly tough and robust data protection is proving to be one way that many enterprises choose to stand out. Recent changes to regulation, such as the introduction of the GDPR, have made compliance standards much higher when it comes to data protection. It’s no longer simply enough to have minimal processes in place that may or may not ensure the safety of data in business systems. Proactive data management is necessary, not just with respect to digital data but data in physical form too. For many businesses, the only way to ensure complete compliance with regulation is to outsource document and media destruction to a professional shredding partner. Many business documents contain staff data, such as employment contracts and payroll information. So, it’s essential that these are properly disposed of to avoid opening employees up to the risks of identity theft or fraud. A well-established shredding service can also help to take the pressure off staff within the business. On site shredding in particular can help to provide a significant boost to productivity. When this is in place staff are not responsible for the process of shredding and can focus more on adding value elsewhere. Their only responsibilities are to ensure that the right documents end up in the right locked bins. This not only simplifies operations but can also enable a workforce to be more efficient and focused. Green office processes can make a real difference to environmental impact and customers and employees are increasingly looking for businesses that invest in them. 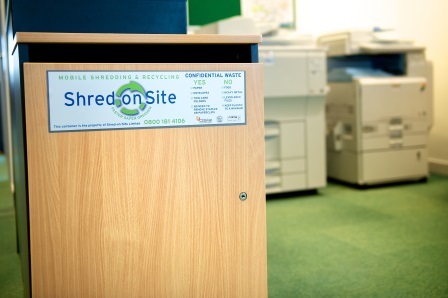 Shredding enables recycling, which is a far greener use of document waste than allowing it to end up rotting in landfill – a much more respectful approach to environmental issues. A shredding service has a lot to offer any business, from improving the level of compliance with data protection regulation to enabling a more environmentally friendly approach.